For the second time in a row, Apple pushed out a new iOS 12 developer beta on a Monday, and for the first time this round, they've done it only one week after the last one. While the August 6 release of iOS 12 developer beta 6 doesn't contain a wealth of updates, there are still a few things you'll want to know about. Overall, the iOS 12 dev beta 6 doesn't seem to include anything huge, just minor bug fixes and security patches. However, Apple did remove the iOS "waves" wallpaper from the mix, then added three new colored wallpapers to the Home app. The Music app has a new splash screen promoting music video features, and AirPlay has a tweaked icon on the lock screen. Dev beta 6 also solves some Bluetooth issues, as well as some Siri-related ones. See the full release notes below to see exactly what those resolves are. But stay tuned for more, though, as we will update this article with any new information we find as we dive into the software ourselves. To update your iPhone to iOS 12 dev beta 6, you need to be a registered developer with a valid configuration profile. If you have iOS 12's new "Automatic Updates" enabled, you can let the software update overnight. To download the new beta right now, however, open the Settings app, tap "General," then "Software Update." 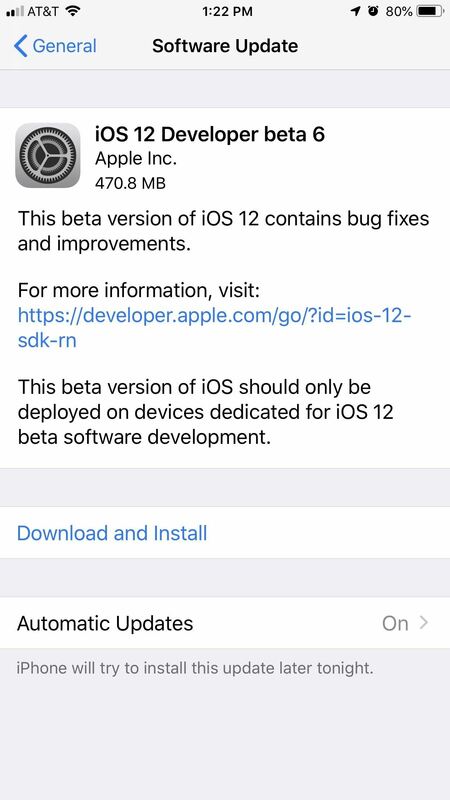 Select "Download and Install," then follow the on-screen prompts to download and install iOS 12 dev beta 6. While this update was for developers only, public beta testers received the same exact update as "iOS 12 public beta 5" later on the same day, which is quicker than in prior iOS 12 public beta releases; Public beta 4 came just one day after dev beta 5. All the release notes below apply to both the iOS 12 dev beta 6 and public beta 5. After restarting your device, paired Bluetooth accessories might not function correctly or might be displayed using the device's address rather than its name. (42397527) — Workaround: In Bluetooth settings, select Forget This Device and pair the accessory to your device again. Using Apple Pay Cash to send or request money might produce an error. (41015948) — Workaround: Include a dollar amount in the Siri request, for example: "Send 10 dollars to Johnny Appleseed with Apple Pay". Users might not see custom UI when using Siri Suggestions Shortcuts with built-in intents. (42406900) — Workaround: Add the shortcut to Siri in Settings > Siri & Search. 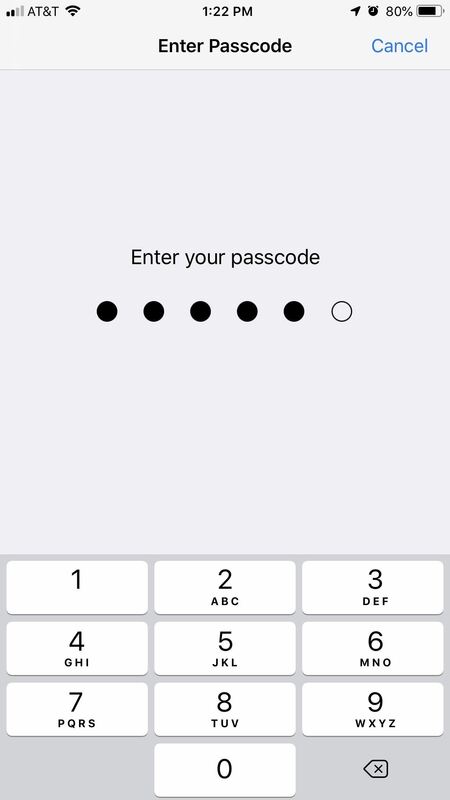 Then use Siri to run the shortcut and verify the custom UI within Siri. Apple TV (3rd generation) might not function as a HomeKit hub in beta 6. Apple TV (4th generation) and Apple TV 4K might not appear as a HomeKit hub unless setup was completed using an iOS device. (42782193) — Workaround: Add Apple TV to the home via Settings > AirPlay > Room. Group FaceTime calls cannot be initiated between iOS 12 beta 3 and the first iOS 12 beta release. (39873802) — Workaround: Users should update to iOS 12 beta 3 or later. Settings might unexpectedly quit when attempting to open Siri & Search settings if you have uninstalled FaceTime, Mail, Maps, or Voice Memos. (42789893) — Workaround: Install the missing apps.